If you love community and desire the freedom of your own kitchen, the Quads are the place for you! 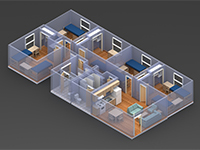 Each suite contains five bedrooms, each of which houses one or two students. 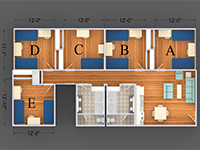 Nine students share two large bathrooms, a full kitchen, and a living area. Get to know your suitemates and become part of a close-knit community within the larger community of Liberty University. With easy access to dining locations, parking, and the bus route, the Quads are a great place for students who love a flexible lifestyle. Mailbox kiosks are located in the nearby Circle residence halls and laundry facilities are located in both the South Tower (female only) as well as on South Campus (024-1).